I have in the uk a 1928 20-30 model w. i would like to know what the correct mag would be and where to get one from and also how i could perhaps trace its history. thank you all in advance. You got a gem there. My uncle floyd estate sold his 30-50 for 20K and that was about 20 years ago. I suppose there s a limited market but would be interested in what you find and get. good luck! I have two perfect never used Light-Weight Oil Pull tractor pocket watch leather FOB s. On the back it says Advance-Rumely Power Farming Machinery - La Porte, Indiana. Any interest in these The strap is leather and the badge is at least gold colored plated perhaps . Very nice condition. Looking for supplier of engine parts etc for 1928 Rumely 20-30 W Liners, Rings, Bearing, Valves etc . New or used. Thanks. I borrowed an old Rumley that a neighbor had buried in his barn to build a dam in my pasture. It sure wasn t the light weight . It compacted the dam very well and it is still there. I used it in about 1956-7. I have a picture of one like it threshing oats in Renton. Wa. in about 1980. Am looking for spark plugs for a mid 1920,s lightweight Oil Pull. Do not have any part numbers. Have been left in charge of my grandfathers 25-45 X . This is one of my favorite of his collection. I enjoy running it every year at the Rock River Thresheree. Does anyone have time to chat about running the old girl. I generally dont have any problems starting her, when she is cool or shaded, thanks Mr. Standish for that info, I was wondering if the heat of the day was a factor, and I do think it is . Just looking for some fine tuning or general operational information, thanks. Looking for a water tank and an air filter for a 16-30 Model H Rumely. What is a 20-30 that runs good and is decent shape worth?? Hi. I am looking for a picture (good one) of a 1922 Rumley Oil Pull 20-40 Model G. We have restored one and want to know exactly which decals are correct and where they go. Thanks to anyone who can help. In the summer of 1938 I pitched many bundle of wheat into a threshing machine powered by a Rumley Oil Pull. Tom, the owner of the Rumley, was rather careless when filling the water tank of the Rumley. He simply dipped water out of stock tank and filled the supply tank. Sometimes he might get a grasshopper or two or perhsps some moss in with the water. That meant that on occsion as we were thresshing wheat, the Rumley would lose power because somehing had plugged the water line. The result was that the Rumley would overheat, since it was not receiving water with the fuel to cool the engine sufficiently. So we pitchers would get a rest until Tom got the grasshopper, or whatever else might have plugged the line, out. I just acquired a nice 20-30 W. It is a nice running tractor. I have what I believe is a 15-25. It's in good shape but I will need a few parts for it, like a exhaust valve and some magneto parts. I am new at this so if someone can me direct me to a parts source I sure would appreciate it. Sure would be nice to see pictures of OS4 McCormick Deering 1950 and up. Thank You. I have my dad's old Rumley put the valve cover is gone so I don't have the serial number. It's a light weight model put I don't know the model number. Is there another way to determine the serial number and model of this tractor? 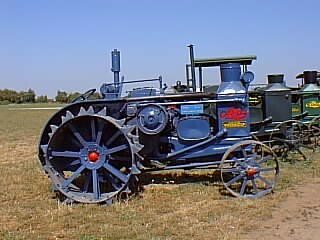 I attended the Old Threshers Reunion in Mt Pleasent Iowa, I saw an oilpull tractor with the name Reeves on the side. I didn't get a chance to talk to the person who owned it but my brothers name is Reeves and I was wondering if anyone can tell me who or where these were manufactured? I would like to know if anyone has a Magneto, good one, that they would sell for a 20-40 model G Rumley Oil Pull.and what price. Have a small shed on a recently purchased farm site which we where told at one time had been from an old tractor. They thought it was a Rumley but not certain. Can anyone tell me where any type of confermation or identifying markings may be? Roof has shaped arch with metal over wood shingles. My name is Dennis Walker Iam from Campbell River B.C. Canada . The people that had my tractor before me took it apart and lost the four rockers and bushings that go with them. So Iam in dire strates for a set of these.The tractor is a 1927 modle L Rumley oil pull,the rest of the tractor is there and in real nice shape. So if any one reading this can help with any leads or parts I would realy appreicate this. My phone is Nites and weekends area code 250 923 2865 or e mail at the above email address. thank you very much. My father has oil pull tractor small model.The handle for the fly wheel is broke, we are looking for a manual or possibly handle for the fly wheel. I OWN A 20-30.FOR MANY YEARS HAVE RUN A 28"THRESHER AT THE SPOKANE INTERSTATE FAIR AND A IHC HAY PRESS.I DISC MY 8 ACRES IN NORTH IDAHO WITH IT.A GREAT TRACTOR.CAN BE A TOUGH TO START WHEN WARM. I drove a bundle wagon in a threshing ring here in Indiana when I was in high school. They used a Rumley oil pull for the seperator. I don't know the model but as a high schooler it SURE LOOKED BIG. Happy memories. I would like any information on the paint schemes for a 1927 model 25-45 rumley. My Dad used three different Rumleys as a boy. One was a 15-30, and I don't remember the number of another Rumley that had a detachable front axle, but the third one was a 30-60. I also own a 20/30 Rumley. I also painted mine the light grey color like the one shown in the picture. I have been showing mine at the Pioneer Park Days in Zolfo Springs Fl. for the last 10 years or so. There is an oil pull Rumley on display in the town of Miles, Texas which is in SW Central Texas. It is at the entrance to the town and fronts on US Hwy 67N. I think it belongs to a family named Schwertner, but am not sure. The local tractor/trader type in Miles is Wendell Arrington and I am sure he could tell a person anything they might want to know about the tractor if they would call him or write him at PO Box, Miles, Tx 76861.
they cool with oil instead of water!! I am searching for blueprints/schematics for oil pulls. I plan to offer a casting kit for a running 1/8 scale model. please email me if you have any info on blueprints / schematics, or if you are interested in one of the kits. thanks!